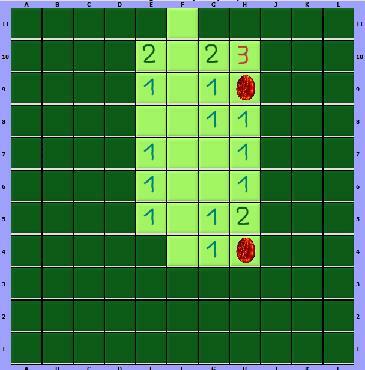 The game is a variant of the popular Windows game and changed so that it can be played with 2 players. At the start of the game 15 dragon eggs are hidden in the 11x11 board. The goal of the game is to determine (or guess) where the eggs are before your opponent does. For guessing a egg correctly you earn points, if you guess wrong you will loose points. If all eggs are found the player with the most points wins the game. 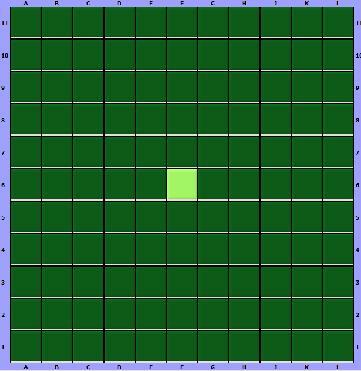 - Click 1x on a spot (Black question mark with light green background): this will show the number of surrounding eggs. Watch out: if there is an egg on this spot, then you will get minus points (see below). -Click 2x on a spot (White question mark on an egg with light green background): now you guess that there is a negg on that spot. If you are right you will earn points, if you are wrong you will loose points (see below). - If you accidentally hit an egg: -5 points. - If you guess an egg correctly: +5 points. - If you guess and there is not an egg: -2 points. The game ends if all 15 eggs are visible (found and/or hit). The player with the most points (or least minus points) wins the game. If both players have the same amount of points, the game ends as draw. You get this if you click once on a undiscovered cell. If you confirm the move, it will show the number of eggs surrounding this cell (gives you minus points if there is an egg!). You get this if you click twice on a undiscovered cell. If you confirm the move, it means that you guess that here is an egg (points if you are right and minus points if you are wrong!). There is no egg in the surrounding cells of this cell (horizontal, vertical, diagonal). There is excatly 1 egg in the surrounding cells of this cell (horizontal, vertical, diagonal). There is excatly 2 eggs in the surrounding cells of this cell (horizontal, vertical, diagonal). There is excatly 3 eggs in the surrounding cells of this cell (horizontal, vertical, diagonal). There is excatly 4 eggs in the surrounding cells of this cell (horizontal, vertical, diagonal). There is excatly 5 eggs in the surrounding cells of this cell (horizontal, vertical, diagonal). There is excatly 6 eggs in the surrounding cells of this cell (horizontal, vertical, diagonal). There is excatly 7 eggs in the surrounding cells of this cell (horizontal, vertical, diagonal). There is excatly 8 eggs in the surrounding cells of this cell (horizontal, vertical, diagonal).